WA OEO works with families from all communities state wide to resolve problems that impact student learning! Check Out OEO Mission & Services! English Skills: Reading, writing, speaking, listening with focus on trades jobs, training and safety. Reading blueprints, math for trades, job readiness, team skills and customer service. Preparation for Trades I-BESTs: CNC Machining, Auto MLR, Auto Body. This course is only $25!! Contact 206-934-5363 or stop by the ESL office located in the Robert Smith Building, Room 2, on our main campus (South Seattle) 6000 16th Ave SW. This bill addresses structural problems within the educational system that disproportionately affects students of color and reduces their opportunities to excel academically. Specifically, the disconnect between students of color and their educators; the disconnect between schools and families of students of color. As well, the bill centers on student discipline reform and the lack of quality student demographic data needed by policymakers. When: Wednesday, March 30th from 1:30 p.m. – 2:00 p.m.
Workers Right Curriculum - Washington State Labor Education and Research Center at the Georgetown campus of South Seattle College. Join us for a hands-on interactive workshop by 21 Progress that uses storytelling to communicate labor laws followed by a workshop with the Wage Claim Project. Learn about labor standards in Seattle, share your experience as a worker or as someone affected by unjust work conditions. Light food will be provided. Open to family, friends, and co-workers! Members of our coalition have raised the issue of translating our voter ballots and pamphlets into other East African languages. We will be meeting with Councilmember Upthegrove to talk about this issue. Join the Coalition of Immigrants Refugees and Communities of Color, Got Green? and the Washington Bus for the final Youth Agenda canvass of 2015! Want to scope out your trick or treat route? Join us as we knock on doors in District 2 to remind young people to turn in their ballots with the help of our handy voter guide ( http://seattlevoterguide.org/). As always food, high fives from your favorite votebot, and a great time are on us. To RSVP check out the link above. This forum is for ALL districts and at-large positions. CIRCC members have prepared several questions for all the candidates. 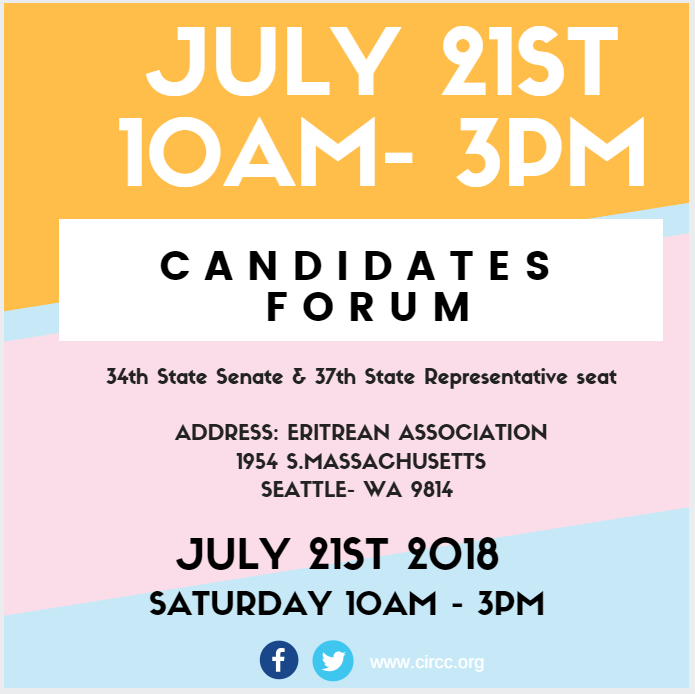 Members of our communities will meet candidates, raise important issues facing our communities, and have the chance to directly ask candidates their questions. Candidates will respond to our communities’ issues and how they will address them. Lunch will be served, entertainment, and voter registration is all included in this event. Event is FREE and open to the public.